Visitors to an eCommerce website are statistically more likely to conclude their visit with a purchase if they utilize product filtering. It’s easy to see why that the quality and quantity of filtering options can have a dramatic effect on a merchant’s eCommerce business. In spite of the tremendous value rich filtering can provide a vast majority of websites are underutilizing or omitting filters from their shopping experience. This is because most eCommerce software that sets up groups of filters and specific filter values for individual products, can be a cumbersome and labor-intensive task. SearchFit eCommerce meets this challenge head-on with innovation: introducing SearchFit Dynamic Product Filters. 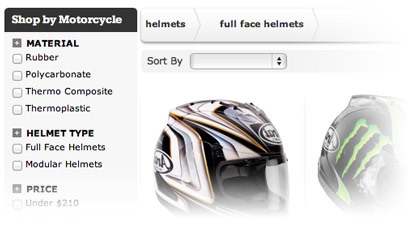 SearchFit Dynamic Product Filters allow your customers to narrow down the viewable products to match specific characteristics they are looking for. With a few simple clicks a merchant can set up automatic filtering based on categories, manufacturers, and pricing, with no additional work needed. For an even more robust shopping experience, merchants can use filter groups and custom filter values to provide a multitude of options for a visitor to filter by. For example, a store that sells outdoor sporting goods could use filter groups within their apparel categories so customers can filter by a certain color, size, material, brand, or cost. Then, separately, in their archery category users would be shown filters for recommended age, handedness, skill level, etc. Being able to easily create and maintain unlimited groups of filters that only display in appropriate categories is a game changing feature for most eCommerce merchants.